Uwe Groebel started Voodooshock, after NAEVUS split in 1998, with various drummers and bassplayers until he recorded the first Voodooshock demo in 2000 with Matze Siffermann and Oli Merkle from End Of Green. In 2001 he was joined by Michael Greilinger (bass) and Christian Specker (drums). At first it was only for the recordings, just to see how it is working together for the already written songs. But then they knew shortly that this is really working out. VS recorded in 5 days and released the debut cd on Psychedoomelic Records in 2002. The rerelease of the demo with two extra songs in 2004 and a split 7” with Conans Iron Kind (US) via Psychedoomelic Records and Game Two Records (US). 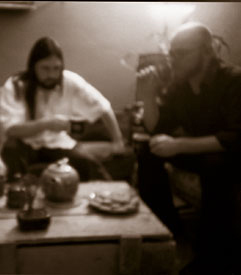 In june 2005 Voodooshock returned to the rehearsal room with two new members. Ingmar Petersen on bass guitar and Claus-Peter Hamisch on drums. Both play in Beehoover. A great band! Voodooshock recorded two new songs for a 7" single on Psycheddomelic Records. "The Golden Beauty" and "Live For The Moment". End December 2006, Voodooshock will enter studio for an upcoming release in 2007 on Exile On Mainstream Records. Started playing guitar with the age of 14.Heros were Steve Vai and Hendrix. The first band he founded was NAEVUS from 1991 to 1999. He played guitars and did the vocals. At the beginning it was more like a slow death-metal band in the veins of Anathema/ My Dying Bride/ Asphyx and developed more and more into this rock/doom thing, very much influenced by Black Sabbath and the likes. They recorded three demos through the years and with the last demo “Autumn Sun” in 1996 they signed a deal with Lee Dorrians’ Rise Above Records, UK. The debut recording was recorded in 1997 and released in 1998. In 1999 Rise Above and Music For Nations let them go due to lack of money (that’s what MFN said…) and the band split in may 1999. Two other guys from NAEVUS, Mathias Straub plays in Sacred Steel, Oliver Grosshans plays in My Darkest Hate. 3. Electric Wizard - Come My Fanatics. Really early he punished moms pans and cans. So at the age of 8 years his dad produced the first drums from out of washing powder cans. First shows he played in crazy and obscure scholl festivities ( sadly there are no recordings of it…). He decided to learn drums at the jazz school for two years. Specki plays in monochrome today.